Try your skills on the finest scenery on the West Coast while experiencing high altitude living adventures. Participants will have the opportunity to shoot iconic Emerald Bay, majestic mountain settings, and of course beautiful Lake Tahoe! Scenic points of interest include Fallen Leaf Lake, Hope Valley, and Taylor Creek. The first ever state-of-the-art Digital Photography Institute (DPI) will take place during summer 2012 in scenic South Lake Tahoe, California, a world-class vacation resort destination. This intensive weekend Institute to be held June 29, 30 and July 1, 2012 will provide “on location” shooting experiences for participants. After taking advantage of shooting the natural beauty of Emerald Bay, Taylor Creek, Hope Valley and Lake Tahoe, also known as the “Jewel of the Sierras,” participants will have access to the newly constructed $65 million facilities at South Tahoe High School. The Tahoe Art and Design Academy (TADA) at S.T.H.S. includes MAC Labs, cutting edge software, experienced instructors and trained staff to enhance the learning experience for DPI participants. Institute participants will begin their photography adventure on Friday night, June 29, 2012, with keynote speaker, Tim Peare, a professional snow-boarding photographer for Forum Snowboards and Snowboarding Magazine. Participants will delight in hearing about Tim’s passion for photography and for capturing the essence of nature, raw sports talent and art through the medium of photography. Sunrise and sunset photo shoots around Lake Tahoe, as well as hands-on Photoshop editing techniques will fill the next Institute day, Saturday, June 30, 2012. Students will begin their day shooting iconic Emerald Bay and then enjoy the opportunity to experience different Institute Breakout Sessions covering a myriad of topics such as working with bright outdoor lighting, artificial lighting techniques and even capturing images of a recent and tragic wildfire burn site. Learn more about the institute presenters/instructors. Trained instructors and experts will assist participants using the newly constructed Digital Media arts labs and editing bays, modeled and constructed to mirror high-tech Hollywood studios, all located on the beautiful and pristine campus of South Tahoe High School. All proceeds go to support student scholarships and grant funding through the non-profit Lake Tahoe Educational Foundation. Registration ends May 31, 2012. 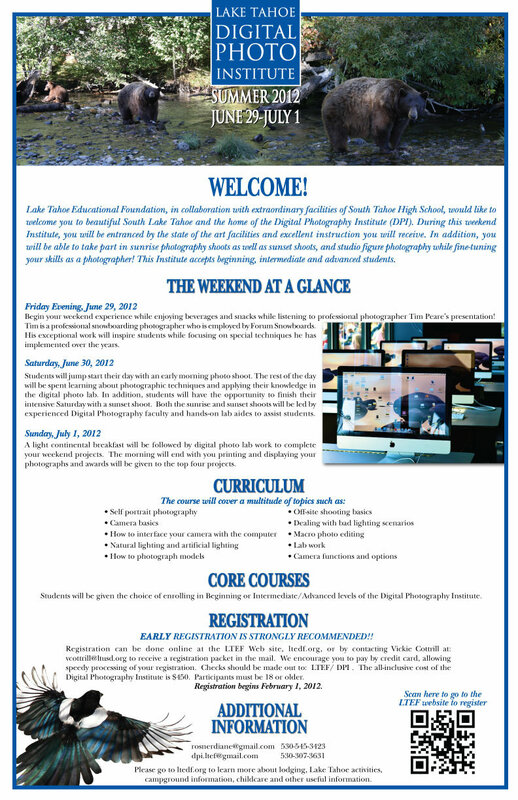 Digital Photography Institute PosterLake Tahoe Educational Foundation, in collaboration with the extraordinary facilities of South Tahoe High School, would like to welcome you to beautiful South Lake Tahoe and the home of the Digital Photography Institute (DPI). Registration FormRegister now to reserve your space in this inaugural program! Photography Institute Schedule / OverviewTake part in sunrise photography shoots, sunset shoots, and studio figure photography while fine-tuning your skills as a photographer! This Institute accepts beginning, intermediate and advanced students.